The text read: “There is music in heaven tonight.” And that was how I found out about the passing of Sir George Martin. All day in Louisiana, it has rained and rained, and while I think that heaven’s outpouring of tears is so fitting, I do believe in what my friend, Lanea Stagg, texted. There is quite a jam session going on just beyond our reach, just beyond our realm. There is a party for George Martin tonight! 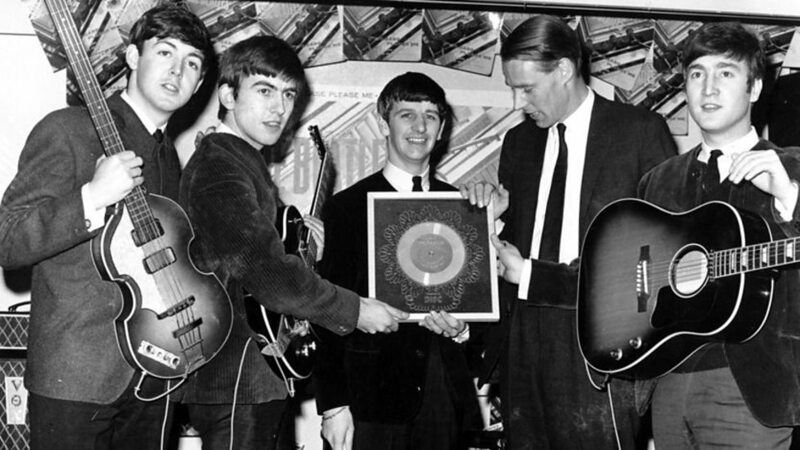 George Martin loved music. Classically trained at the Guildhall School of Music in piano and oboe, he also adored complex jazz, folk music, and yes – after a season – rock’n’roll. And Martin’s various and elegant musical tastes came home to roost in the diverse catalog of The Beatles, as he introduced them to harpsichords, horns, and violins. Martin, a confident musician, urged them to take chances. He echoed their need to grow and evolve. And despite many obstacles, he found a way to make their complex recording dreams into concrete realities. But most of all, George Martin listened and understood. When four unknown boys from the rugged North refused a Tin Pan Alley song – a sure hit like “How Do You Do It” – and insisted that recording it would “ruin them in Liverpool,” he listened. When they insisted that they were composers and that they could write a song that was “just as good,” he believed them. When they said that they could rework their limping tunes and make them into winners, he stood beside them, giving them the chance to try. And when no other recording label would represent Brian Epstein’s skinny, ragtag Beatles, George Martin gave them that chance. He was the open door through which they walked and the welcome hearth at which they warmed themselves and felt at home. George Martin was never “a friend of the lads.” They respected him too much to let him see the whole story. At first, they hid their drugs from him. They kept their language clean. They spoke to him with deference, even when they didn’t like his tie. As the years passed, they relaxed quite a bit. But The Beatles always looked up to George Martin as an uncle (in fact, he reminded John of his beloved Uncle Ge’rge), as a father, as a favorite professor in school. And he loved them in a way that he never did any other act or group or collection of recording artists. Between them, there was a bond. It was a bond beyond music…a bond that allowed The Beatles to test limits and try new things, to step over the borders of the known and venture into the murky unknown. It was the bond one feels inside one’s chosen family: the family that is peopled by one’s truest friends. 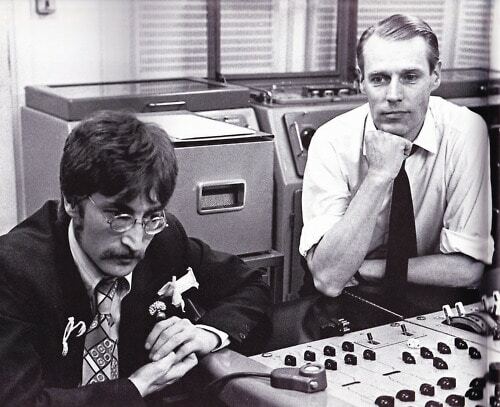 And so The Beatles’ greatest moments were Sir George Martin’s moments. Their happy days were his. Their successes were his successes. And he never missed a chance to let them know. He flew to Paris and celebrated the announcement of their first American No. 1 hit. He flew to America to watch them perform at the Washington D.C. concert in February 1964. He sat in uncounted audiences, stood in the myriad stage wings with Brian, stayed up to ungodly hours in the studio, and endured tardiness, irritability, and frustration, when times were hard. He always found a way to make things happen. He always found a way to create the quirky and unusual sound the boys (especially John) craved when no one else could. He found a way to bring their magic to life and to bridge the gap between the possible and impossible. He could do that. I wonder who’s performing tonight? Certainly John and George, center stage, smiles wide…and David Bowie, I’m quite sure. Perhaps, in a sidelight, a phenomenal lick from Jimi Hendrix. Some passionate soul from Otis Redding and Bobby Hatfield (who can finally be heard above the screams). And the clear sound of Glenn Frey blending with the velvet voice of Maurice White. And there, in the midst of them all, stands Sir George in his crisp, white shirt – arms folded and head down, listening, mulling, finding a path. “Let’s try it once again,” he’s suggesting. “And this time, let’s sing the intro instead of playing it on the guitars. Let’s speed it up a bit and…well, let’s see what happens. Shall we?” And so it begins. There is music in heaven tonight, as there always is. But tonight, it has a new producer. My guess? It’s destined for the Toppermost of the Poppermost. Odds are, He will love it. It is a sad day in Beatles World and for music lovers around the world. George Martin passed away last night at the age of 90. There is no question George Martin will be remembered as the most important and successful Record Producer of all time. How did a comedy record producer for a small EMI subsidiary get to be the producer of the greatest band of all time? It was because, being from Liverpool, The Beatles had a wonderful sense of humor and knew some of those recordings. During their first sessions, Beatle George broke the ice with his now famous line “For starters, I don’t like your tie.” Together over the ensuing seven years, they created the soundtrack of our lives. George first as their producer, then teacher, then interpreter of how they wanted their recordings to sound. It was a team effort and the stars were indeed aligned. I had the pleasure and honor to meet with Sir George a few times, with the most notable encounter coming in the mid 1980s in Los Angeles. We got to spend about 30 minutes together in a private session and I found him charming, engaging, and a delight to be around. At the end of the talk, I asked him if I could ask one question that had puzzled Beatles fans for almost 20 years (at the time). He said okay. “How come the promotional copies of Penny Lane had the trumpet at the end, and the released version didn’t?” He said something like this: Capitol was bugging us for a new single so we reluctantly sent them Penny Lane and Strawberry Fields Forever (we all know he regretted not holding them for Pepper). They were so deep into the Pepper sessions, they sent the final version over, not even aware there was any difference! It was just one of those things during a day in the life of recording with the Beatles. We are all so lucky to have his body of work almost at our fingertips now. Today we are fixing a hole in our sad hearts in knowing that George Martin has left this world. He will never be forgotten. Our condolences to his wife, Judy, son Giles and the rest of his family. Through the music, we all became part of his extended family. It has been a ride of a lifetime.